The purpose of initial naval (Phase 1) training is to turn civilian recruits into partly-trained naval officers and ratings ensuring that they are ready for subsequent phases of specialist (Phase 2) training, having completed initial training to prescribed standards and gained an appreciation of the seagoing environment. Those who pass are fully prepared to embark on the next phase of their naval training. The Royal Navy is one of the UK’s largest training organisations and provides a wide range of accredited professional courses, lasting anything from a few days to several years and at every level from basic skills to postgraduate degrees. Most of their courses give personnel qualifications recognised outside the Royal Navy, so they can easily transfer their skills to civilian life. This article is divided into seven sections for easier reading with the first section providing a brief overview of the structure of the Royal Navy, whilst the next section provides an overview of the current training landscape. The following two sections look at initial naval training for ratings and officers respectively. Finally, the article will present an alternative view on the role of Phase 1 initial training, before providing some useful links. The Royal Fleet Auxiliary (RFA) (not discussed here). Navy Command HQ: base of the Commander-in-Chief Fleet, his deputy and the Second Sea Lord (2SL). Based at Whale Island, it includes the Command Centre in Northwood and also has support staff in Portsmouth Naval Base. It also houses the Fleet Battle Staff, Maritime Warfare Centre and the Flag Officer Sea Training HQ (FOST HQ). Shore Establishments: these units training Royal Navy personnel for the challenges of life at sea, offering everything from initial training to apprenticeships and post graduate degrees. Naval Bases: these are the home to the Royal Navy’s surface and submarine fleet of ships. Portsmouth, Davenport and Clyde Naval bases offer support to their base ships in the areas of personnel, engineering and supplies. Air Stations: Culdrose in Cornwall and Yeovilton in Somerset are home to the Fleet Air Arm’s front-line and training squadrons. With regards to on shore units, the Royal Navy’s initial military training landscape has undergone a number of changes over the past 20 years. Figure 1, below, presents the ‘current’ (February 2014) Royal Navy military training landscape. The Commander Britannia Royal Naval College (CBRNC), a Commodore, is responsible for the standard and output of the Royal Navy’s leadership academy. CBRNC is also responsible for the Initial Naval Training (Officer) programme, ongoing training of the leadership of the Royal Navy and in over-all charge of the Initial Naval Training (Ratings) programme at HMS Raleigh. The Commanding Officer of HMS Raleigh is the deputy of CBRNC. 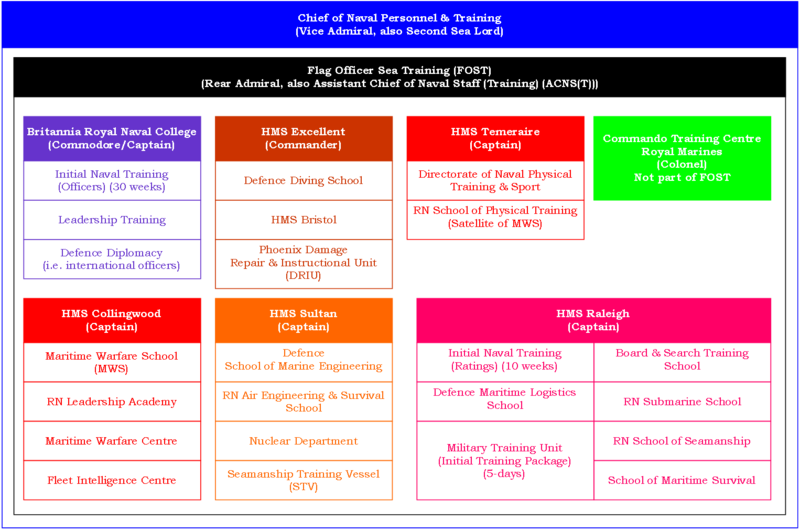 Finally, CBRNC is responsible for the Admiralty Interview Board (AIB), although not a member. Initial Naval Training (Ratings) (INT(R)) is conducted by the Initial Naval Training School at HMS Raleigh in the South West, with a main site covering 239 acres. HMS Raleigh is the Royal Navy’s largest training establishment and the only new-entry training establishment for ratings. INT is 10 weeks long and trainees are usually placed in classes of approximately 30. Trainees will learn basic skills, such as self discipline, teamwork and overcoming problems. In addition, trainees will be taught how to fire a SA80 assault rifle and other skills required of all sailors. Recruits are given a taste of how to operate as a team tackling floods and fires at sea and they will also have to pass a first aid course. Fitness is crucial and a progressive regime will test individuals’ ability to, climb High Ropes and complete the assault and obstacle courses. Training is as practical and active as possible, using simulators and a decommissioned minesweeper (HMS Brecon) to give trainees a real taste of their future careers and the environments in which they will work and fight. The latest technology is used to make classroom learning interesting and interactive. HMS Raleigh also provides specialist training in areas such as seamanship, submarine operations, logistics, military and board and search skills for trained ratings and officers. HMS Brecon is also used for seamanship training, board-and-search training and to give trainee chefs and stewards the opportunity to experience life in a ship’s galley. Other facilities include extensive rifle ranges and a sinking ship simulator used to teach ratings and officers vital skills to deal with an emergency at sea. Trainees at HMS Raleigh at divided into five divisions: Cornwell, Cunningham, Fisher, Gould and Stonehouse (provides support to injured recruits). An outline of the training delivered at HMS Raleigh can be seen in Table 1 below. Within the Royal Navy there are currently three pathways to becoming a commissioned officer: direct entry, professional entry and the upper yardman schemes. Direct Entry: are recruited as civilians and undertake a full course of training to become employable. Professionally Qualified Officers: are individuals who have qualified professionally in the civilian environment and their employment in the Royal Navy will use these qualifications. These are doctors, dentists, nursing officers and chaplains. An Upper Yardman (UY) scheme: candidates will be under 26 (engineers 30) years of age and join a direct entry class, undertaking the same training path and is otherwise treated as a direct entry officer. Candidates for UY can transfer to any specialisation in the Royal Navy officer corps. The Senior Upper Yardman (SUY) scheme: allows for very experienced ratings identified as potential specialist officers to be commissioned. Candidates for the SUY scheme will typically be over 35 years of age (but must be over 26) and undertake a short training period at Dartmouth before being employed within the same specialisation as their rating career. BRNC has four entries per year and each entry of, approximately, 140 will undergo 30 weeks of initial officer training. Typically each intake is 10% female, 10% upper yardmen (ex-sailors under 26 years) and 80% graduates, with an average age of 23-and-a-half years. Approximately 19% of these graduates will have had contact with the Royal Navy at university. From induction, cadets need to get to grips with kit, inspections, physical stamina, drill, weapons and basic maritime skills. Cadets are assessed on knowledge of the Royal Navy, their potential for command, leadership and management, their sea sense and operational context. The learning curve is steep. The aim of INT(O) is to ensure that the young officer is ready for subsequent phases of specialist training, having completed initial training to prescribed standards and gained an appreciation of the seagoing environment. To stimulate, inspire and teach a new generation to act and react instinctively as Naval Officers in the front line: Royal Navy INT(O) BRNC Joining Guide (Word) (2013). INT(O) is divided into three distinct phases: Militarisation, Marinisation and Initial Fleet Time, with the first two phases taking place at BRNC and the third on board a warship. The course is common to all specialisations and lasts for 30 weeks. Militarisation: induction, seamanship, navigation and leadership, culminating in the Assessed Basic Leadership Exercise (ABLE), a 4 day exercise on Dartmoor. Marinisation: maritime operations, academics, further navigation, twin screw boat handling, Basic Sea Survival Course (BSSC) and maritime leadership, culminating in the Maritime Leadership Exercise (MARL), a 4 day exercise on the River Dart. Initial Fleet Time (IFT): 9 weeks at sea on a capital ship culminating with the Initial Fleet Board. ABLE, MARL and IFT are all Pass/Fail assessments. Other elements covered on INT(O) include: social/etiquette, ceremonial, personal development/sport/adventurous training, duties, strategic studies, computing, and presentation skills. 9-weeks at sea in one of the Royal Navy’s major warships learning everything from the fundamentals like on-board safety, fire fighting, damage control drills and how to use all the sea survival equipment to working in every department on board, learning how they operate and how they contribute to the ship as a whole. As part of the above trainees must pass two oral assessments and one written assessment. The final week involves ceremonial marching and drill for the passing-out parade where trainees officially become Royal Navy officers. Once trainees have got the essential basic military and maritime command skills, they will begin the journey of becoming a specialist in the officer role they have chosen. This involves a combination of being at sea and in the classroom. Professionally Qualified Officers (PQO) – including medical and nursing officers – will attend the six-month new entry Medical Officer course including a 14-week induction course at BRNC. PQOs then carry out three years of general duties on ships, submarines or with the Royal Marines. To serve with the Royal Marines, PQOs need to complete the All Arms Commando Course (AACC). If a PQO wishes to join the Submarine Service, they will carry out further medical training in radiation medicine and atmosphere control, before spending four months at the Submarine School at HMS Raleigh to learn about all aspects of submarine operation, warfare, weapons, nuclear propulsion and escape training. BA or BSc in Adult or Mental Health Nursing. Promotion to officer by ratings is via the Upper Yardman (UY) and Senior Upper Yardman (SUY) schemes and those wishing to become UY or SUY must meet the eligibility criteria as laid out in BR3 Part 7 Section 3. The UY scheme is for ratings under 26 years old who will attend INT(O) at BRNC. The SUY scheme, known as Late Entry (LE) Officers in the British Army, is for ratings over 26 years old who will attend a course at BRNC. All SUY candidates must pass selection by the Admiralty Interview Board (AIB), which acts as the Preliminary Selection Board (PSB). Those SUY candidates recommended by the AIB are subsequently considered for selection to enter BRNC in Dartmouth by a Final Selection Board (FSB) chaired by the Captain of Naval Recruiting (CNR). Selection is subject to the requirements of the Service. The probability of selection to BRNC will vary depending upon branch/arm/specialisation. It should also be noted that selection criteria varies between the branches. All SUY officers wear the rank insignia of an Officer Cadet whilst undertaking Initial Naval Training at BRNC, in line with their Direct Entry counterparts, and ship to the substantive rank insignia on passing out. All instructors at Phase 1 and 2 training establishments are required to successfully complete the Defence Train the Trainer (DTTT) course. Instructors receive induction training as well as coaching and mentoring support. New instructors shadow other instructors for at least a month before they are allowed to work on their own.